Taylor Mountain Farm is located In Charles Town, West Virginia and was founded by the late Mrs. Eleanor M. Casey and husband Mr. James W. Casey. The farm was named after Taylor Mountain where Mr. Casey completed his final training exercise in the United States Army while stationed at Fort Dix. Their training career began with the purchase of their first race horse, Royal Sketch in 1963. Juba, popular son of Tapit, has been retired to stud to stand at Taylor Mountain Farm in West Virginia. Read more about Juba here. Taylor Mountain Farm prides itself on its outstanding stallions known for speed, precocity, and, most importantly, soundness. Juba is the first son of Tapit to stand at stud in West Virginia. Taylor Mountain Farm is located In Charles Town, West Virginia and was founded by the late Mrs. Eleanor M. Casey and husband Mr. James W. Casey. The farm was named after Taylor Mountain where Mr. Casey completed his final training exercise in the army while stationed at Fort Dix. Their training career began with the purchase of their first race horse, Royal Sketch in 1963. Royal Sketch, by Trojan Monarch became their first winner in 1964. She had a total of 14 wins, 6 seconds and 3 thirds out of 51 starts in her career. Thru the years the Casey family has become one of the most successful racing families at Charles Town Races. Mr. and Mrs. Casey have owned and trained over 14 stakes winners. The gelding Taylor Mountain, by Dancing Czar was 1989 winner of the Jim Beam Breeders Classic and 1990 winner of the Kamora Breeders Classic. They also were winners of the 1998 West Virginia Breeders Classic with Step Out Dancing, by Dancing Czar to name a few. Their Son, James M. Casey, DVM is a trainer and veterinarian and winner of the West Virginia Breeders Classics in 1997 and many other important races. Their son, John Allen Casey is a trainer and black smith and also manager of the farm. His career wins include the West Virginia Breeders Classic in 1999, the Ronrico Breeders Classic in 1992 and 1993 plus many other important races. Daughter Ann M. Casey, owner and school teacher has won several key races, such as, the West Virginia Lottery Breeders Classic in 1995. As breeders the Casey’s have made a major contribution to the thoroughbred industry in West Virginia and surrounding states not only with their notable breeding stock but also with their generosity to the horsemen. They have owned several important stallions. Their first stallion was Royal Consort and was owned in partnership with son, John Casey and friend, Jay Marshall. They later purchased Dancing Czar, by Nijinsky II. Dancing Czar’s progeny earnings exceeded $2,376,000 with 5 blacktype winners and 7 blacktype placers. Their next stallions, Weshaam and My Boy Adam proved to be even more significant. Wesham has produced 31 stakes horses with progeny earnings over $7 million. My Boy Adam has produced 16 blacktype winners and 16 blacktype placers with progeny earnings over $7.5 million. Their most recent additions include Luftikus, by Meadowlake and Windsor Castle, by Lord Carson. Luftikus already has progeny earnings of over $679,000. He has ranked #1 as 2006 Leading 2nd Crop Sire of West Virginia and Virginia breds by earnings. He has also ranked #2 as Leading 2nd Crop Sire of Mid-Atlantic breds by earnings. Windsor Castles’ first foals are yearlings of 2006. In 2000 they purchased property in Charles Town, WV and designed and built their current facility. It now is home to 4 stallions, over 50 broodmares and their offspring. 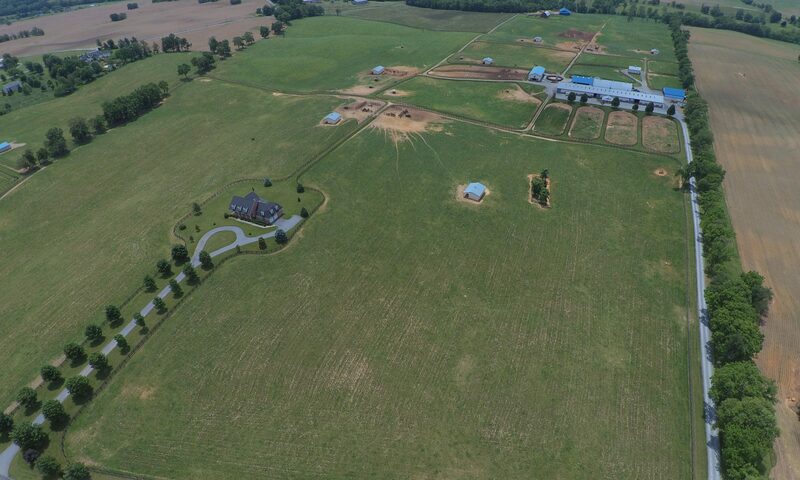 The farm currently has 4 barns, 2 indoor arenas and an exercise machine.